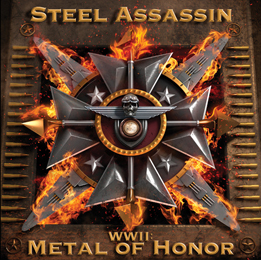 “World War II-Metal Of Honor” is the name of Steel Assasin’s brand new studio album. As you might have already guessed, it’s a concept album. Their guitarist Kevin put a lot of effort into researching the concept. World War II is such a vast topic, it’s no wonder Steel Assassin had to find their own approach to the subject. War is also the subject which has been touched upon a few other bands in the past. Think about Iron Maiden with “The Trooper” and for sure Lemmy Kilmister (Motörhead) is a big collector of (German) war memorabilia. It seems as if Steel Assassin has developed into something like a “theme” band over the years, with every new album dedicated to a new theme. The last song of the albums is one of the biggest surprises. Rush’s “Red Sector A” might be viewed as an unexpected choice but not for the band. The call Rush there ‘desert island’ band. Meaning if they were ever stranded on desert island and could only listen to one artist, it would be Rush. Lyrically and musically it’s a perfect complement to this record. Fans of heavy metal with a story have to check this band out.